I used to work at Borders Books & Music in San Francisco, attached to a mall and close to a university. Having just come back from a trip to the Philippines where I tried to hold and maybe rekindle the type of young love you read about, I was more than happy to be buried and surrounded by books. It was here where I first discovered Frida Kahlo. I don’t remember the first time I started learning about her, but I do remember buying a book of all her paintings. I didn’t know much about Frida, but her work resonated with me immediately even before I knew her story or the stories behind her paintings. A decade later, I was standing in front of La Casa Azul in the beautiful neighborhood of Coyoacán, about half an hour away from Mexico City. 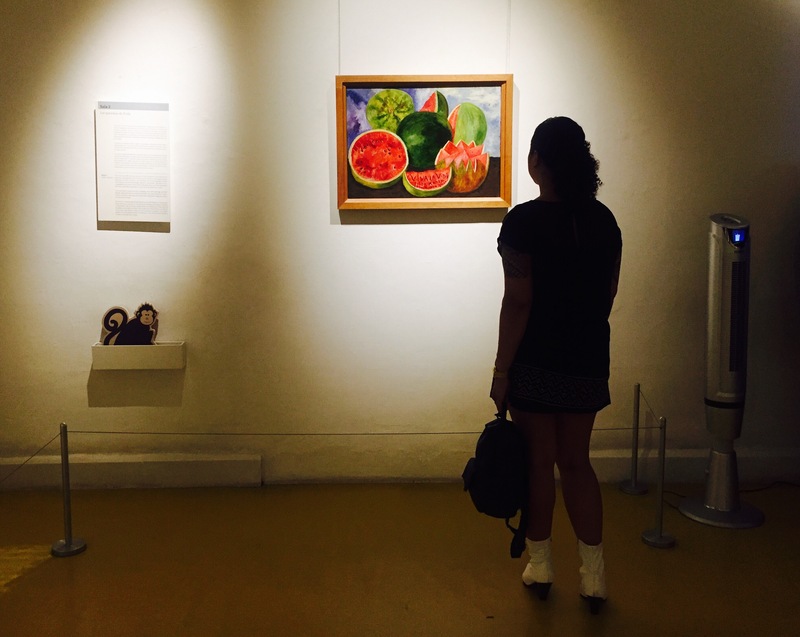 I’ve wanted to visit Frida Kahlo’s home-turned-museum for a long time and standing there, in the middle of the lush foliage and blue walls of the compound I felt like I’ve truly achieved something. Stepping into La Casa Azul felt a lot like stepping into a dream, into the world of Frida. It took me a while to believe that I was really there and I wanted to see everything and do nothing at the same time, for the sheer joy of being in the space. It felt sacred. There were people in the courtyard, sitting on benches and talking, people milling about, people taking photos. There was also an area off to the side where there was a film showing, as more folks trickled in and out of the space. We headed straight to the museum which led to what became Frida and Diego’s home for awhile. These were some of the first few paintings I saw: an unfinished self-portrait sketch made in Detroit, Frida and the Cesarean (also unfinished) and a painting called “Marxism will bring health to the sick” which features Frida wearing a leather corset and a Tehuana skirt. I don’t think I’ve ever seen any of Frida’s paintings in person, so seeing these was an ultimate gift. Most of her paintings are also all over the world — in prestigious institutions like the Museum of Modern Art in New York City, in universities, in private collections and with close friends of hers and Diego’s like Dolores Olmedo. I was planning to visit Olmedo’s museum to check out more of Frida’s work but at the time, the exhibit was under construction. Throughout her paintings — unfinished or completed — Frida’s lust for life was evident. In spite of her illnesses, the numerous miscarriages she had and the heartaches she’s had to endure from Diego, she radiated what she painted in the simplest, but also grandest terms: Viva la ida. Long live life. After her (and Diego’s) paintings were also photographs of Frida herself, with eyes that pierced and a stance so bold, so fearless. I stared at one of her photos for some time, one from Lucienne Bloch’s series. In the photo, Frida is looking straight into the camera, her necklace dangling from between her lips. It was evocative, but firm. A quiet, unyielding strength. There’s also photo of her plaiting her hair, naked from the waist up. In another one, she’s on a boat leaning down against the rail, her fingers playing with the water. Tender, bold and playful at the same time. I thought to myself: How many of us are actually living our lives? How many of us are actually brave enough to stray away from our routines and focus instead on creating our own maps, no matter how arduous? Eventually, the photos gave way to Frida’s study where her books were (still in their glass shelves), her paint, tools and figurines preserved as if Frida herself would come any minute to paint. There were still many people outside in the courtyard even though it was already half past five (the museum closes at 5pm). There were even more people inside the museum still, all of us eager to get a glimpse of the rest of Frida’s house. The line moved an inch and in a few minutes, I was standing in front of her day bed, which was in direct view of the courtyard. I imagined Frida, in her later years, still filled with love, hope and longing, looking out into the sun and the sky. While I started taking photos of every detail, I realized that she had also put up a series of photos of the most important political theorists of our time: Karl Marx, Vladimir Lenin and Mao Zedong. Frida’s political involvement started early as I recalled reading about The Cachucas, children of the revolution that Frida was a part of along with seven boys and one other girl. Their ideological cocktail was composed of Socialism, Romanticism and nationalism although their passion for poetry and literature overshadowed their politics. Today more than ever I feel a sense of companionship. For 20 years, I have been a Communist. I know. I have read conscientiously [crossed out] the principal origins mixed up with ancient roots. I have read the History of my country and of almost all other nations. I already know their class struggles and their economic struggles. I have a clear understanding of the materialist dialectic of Marx, Engels, Lenin, Stalin and Mao Tse-tsung. I love them because they are the pillars of the new Communist world. As I walked out of the museum, down the stairs which led to an outdoor hallway of her and Diego’s collection of native artifacts, I was overcome with a thousand emotions. I was sad and excited at the same time. I felt small and grand. Frida was as big as life itself, and I had mine to live fully.